Aeranthes are found in Madagascar, the Comoros, and Eastern Africa and have 44 species. This genus was established in 1824 by John Lindley. 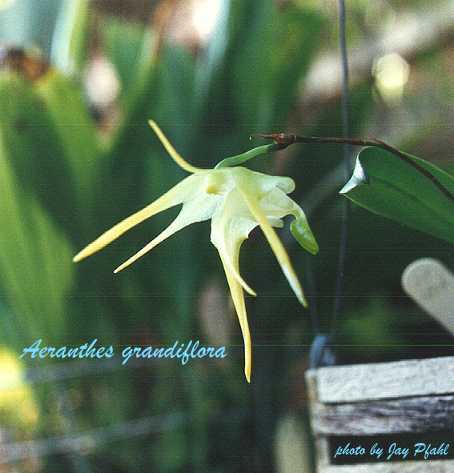 The type species that he used to establish the genus is Aeranthes Grandiflora pictured above. It has 2 pollina each with it's own viscidium in hyaline transluscent flowers that have a spurred column foot borne on wiry scapes. They have distichous leaves with no psuedobulbs, a 1 to many flowered, pendulous infloresence with green, yellow and rarely white flowers.